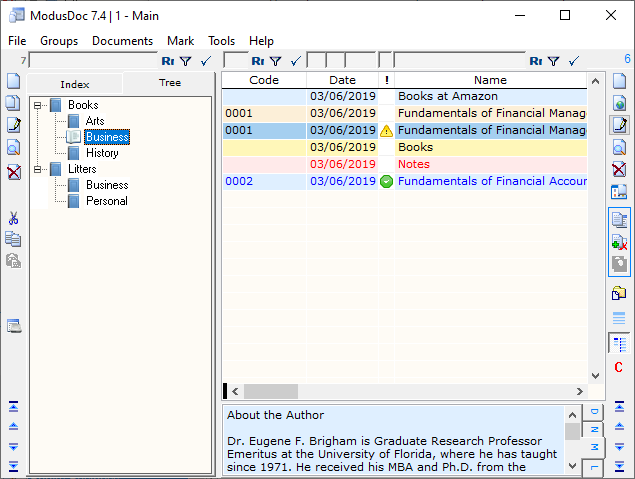 Universal data cataloger designed for cataloging documents / files, hyperlinks, programs, folders and notes in a database for the purpose of gaining quick and convenient access to them. No file type restrictions in ModusDoc's database; all objects that can be run by double-clicking on them or through the Start menu also run from ModusDoc cataloger by double-clicking on the record or using the button on the toolbar. Universal data cataloger ModusDoc was designed for cataloging diverse data: documents, e-books, audio books, movies, photos and other files, hyperlinks, programs, folders and notes in a database for the purpose of gaining quick and convenient access to them.Documents and other files can be stored directly in ModusDoc's database or the database can store the hyperlinks to these documents/files.ModusDoc data cataloger allows creating an unlimited number of databases. Each ModusDoc can have individual configuration: have hidden or rearranged columns, added new ones of various types (symbolic, textual, numeric, logical, date, date and time).Each ModusDoc database consists of a GROUPS and a RECORDS table. Groups are presented on two tabs, Index (linear structure) and Tree (hierarchical structure); the program generates the tree automatically!The filtering (selection) tools located immediately above the group tabs and above each field of the records table allows locating required data quickly and conveniently.A group can contain documents and other files (both embedded and bound, as hyperlinks), shortcuts to the applications that created these documents, hyperlinks to Internet resources related to documents and programs presented in the group, as well as folder shortcuts and notes.A hyperlink (shortcut) to the same object (document, program, folder, etc.) can be presented in multiple groups simultaneously.You can add any documents to ModusDoc database, including e-books, audio books, movies, photos and other files, shortcuts or folders, by simply dragging them with the mouse. You can drag hyperlinks, selected text, e-mail messages - ModusDoc cataloger will automatically create the respective records (hyperlinks or notes). Moreover, you can add all objects located in a folder by simply selecting the folder in the dialog!